Nothing is as appealing and attractive and likeable and loveable as a cute kid. 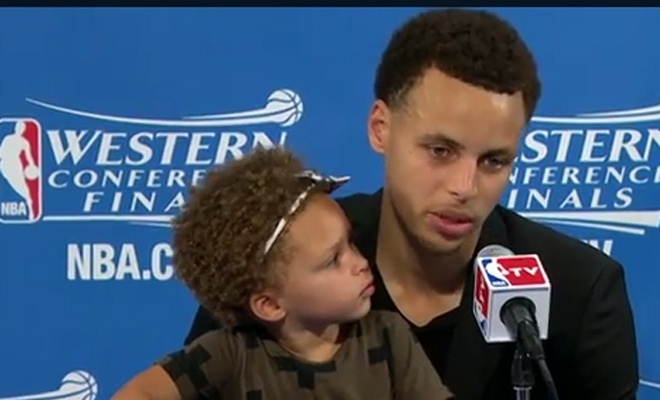 And Stephen Curry’s daughter Riley ranks right up there with the cutest of ‘em all. 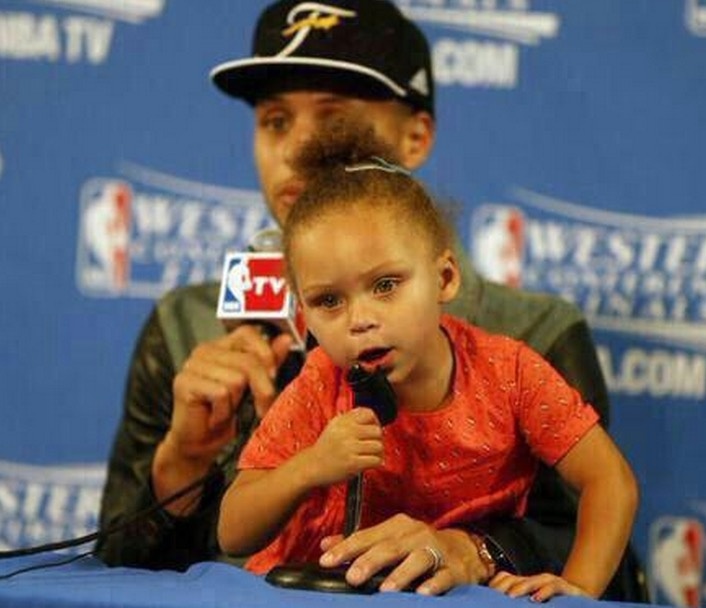 While daddy Curry has been lighting it up on the court, Riley Curry lit up a post-game press conference while her father tried in vain to address questions amidst her competition. Steph Curry’s two-year-old daughter joined him for a post-game press conference after Game 1 of the Western Conference Finals. Curry had 34 points in the Golden State Warriors’ win over the Houston Rockets, but his daughter stole the show with her hand-waving, microphone-hijacking and just general cuteness. Yes, Riley Curry has become the star of the show that everyone wants to watch. And so there was an ACT II in which she was just as endearing and adorable as the first appearance. Not everyone thought it was adorable, however, as several members of the sports media communicated their opposition for children at “pressers,” which is sports speak for press conferences. For instance, Skip Bayless of ESPN’s First Take said Riley’s presence “hurt the process.” Really? Seriously? Bah humbug. Unfortunately, Skip Bayless’s reaction once again proves that you can’t please everyone. And you can’t appease everyone. But you can displease anyone who does not have a fix and a focus and hold and a handle on what is right and real. Such is life. Somebody is going to be cross and crass and cranky and contrary even with something as pure and pristine and picture-perfect as Riley’s presence at the press conference was. It’s a sad truth that some just don’t get it. But such is life. So don’t let the unfortunate, untoward and unseemly undermine your joy. The unbecoming and unbefitting ones amongst us should not steal the show. The knock and the “No’s” of the negative naysayers shouldn’t stop the rest of us from enjoying the fresh and tender and sweet and pleasing and memorable moments Riley rendered for us. The right and reasonable thing to do is to enjoy joy and gladness anywhere we can get it; we should always laud and applaud the Riley’s amongst us, whenever and wherever they show up. Even at a post-game press conference.